The Brandix Group has been recognised as the largest corporate blood donor in Sri Lanka for the eighth consecutive year, following the selfless contribution of over 4,000 pints of blood from inspired employees to the National Blood Transfusion Service (NBTS) in 2017-18. 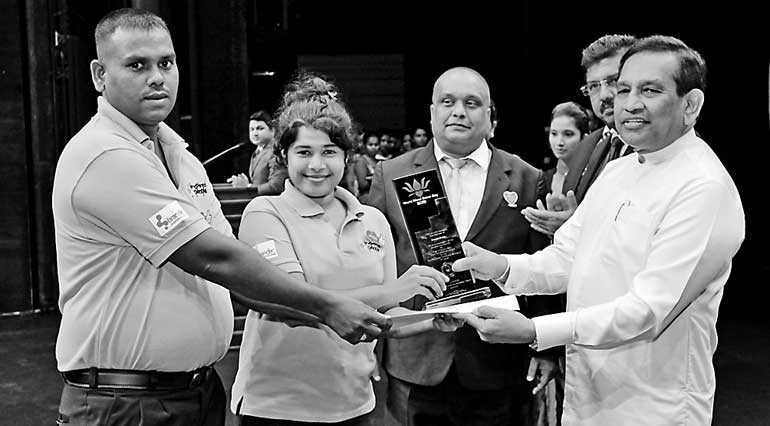 Minister of Health, Nutrition and Indigenous Medicine Dr. Rajitha Senaratne presented Brandix with a special plaque of appreciation at a national ceremony on 14 June – World Blood Donor Day – in recognition of the Group’s contribution. Significantly, the accolade was accepted on behalf of Brandix by the highest individual donor from the Group and a representative of the highest contributing factory from among the 26 Brandix locations that participated in the Group-wide blood donation drive. Brandix has organised annual blood drives in collaboration with the NBTS for the past 11 years, during which, the Group’s Associates have donated 28,534 pints of blood in total. “A commitment that has spanned over a period of 11 years is truly an inspiration to the corporate sector as well as our nation, and is representative of the kind of ‘Inspired People’ that help make Brandix what it is today. As an organisation that is driven by its credo of ‘Inspired Solutions’, continuing our commitment to provide a solution to the nation to address the need of blood amongst our fellow citizens year on year has now become a calendar event at Brandix. We not only look forward to continuing this endeavour with the invaluable support of the NBTS in the years to come but will also continue to increase the number of pints of blood donated year on year,” said Brandix Group Chief People Officer Ishan Dantanarayana. According to the NBTS, donations of this scale over a significant period of time are necessary to meet the establishment’s blood supply requirements. By being geographically widespread, the Brandix campaign increases supplies of blood in many areas, including those that do not often receive donations of a higher volume in comparison to areas like Colombo. Brandix blood donation campaigns are also conducted on weekdays instead of the general norm of weekends, which is particularly helpful in sustaining blood platelets that have a lifespan of five days, for use during the course of the week. Ranked Sri Lanka’s Most Valuable Corporate Export Brand in 2015, 2016, 2017 and 2018 by Brand Finance, Brandix is the country’s single largest Apparel exporter, and has been named ‘Sri Lanka’s Exporter of the Year’ by the Sri Lanka Export Development Board (EDB) over the past three consecutive years. The Group is also the highest employment provider in the country’s Export industry according to the EDB. The pioneer of the concept of ‘total solutions’ in Sri Lanka’s Apparel sector and a preferred supplier to some of the top retail brands in the US and Europe, Brandix is also a benchmark and international award winner for eco-friendly manufacture and commitment to environmental best practices.